The fancy color diamonds are very rare. They are 1% of the entire diamonds in the world. There is no pricelist for fancy color diamonds. They are sold by the market preferences. Large fancy color diamonds are usually sold in auctions around the world and can reach very high prices. Only in the mid 70’s the GIA developed a range scale for fancy color diamonds. The first fancy color diamond that was ever found is the “Eureka Diamond”. It was found in 1866 on the bank of the orange river next to Hopetown in South Africa. It weighs 21.25carat, Fancy Brownish Yellow Color. In order for a diamond to be considered fancy color, color must be visible clearly from the crown. Therefore, while checking the color of fancy colored stones from the pavilion is important, the appearance of color from the crown is most important. Blue color is caused by an addition of Boron in the stone. Less than 0.1% of the fancy color diamonds are blue diamonds. Most of the blue diamonds have high clarity grades. Fancy yellow is caused by an addition of Nitrogen. The fancy yellow is the most common. 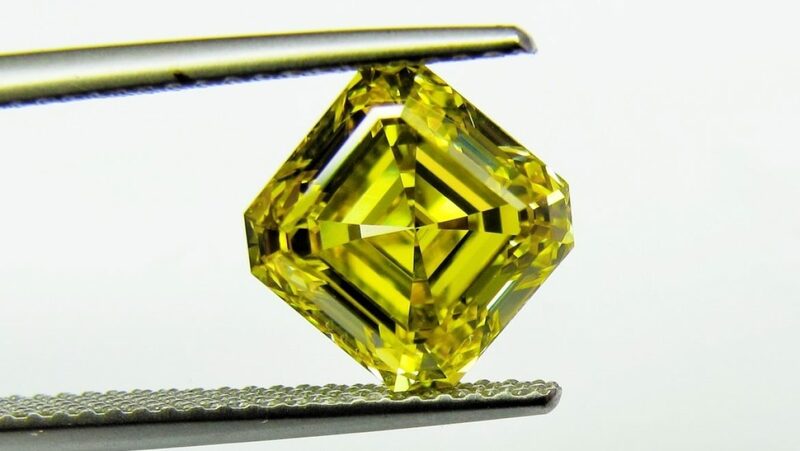 60% of the fancy color diamonds are yellow. Green color is caused by absorbing millions of years radioactive radiation in the ground. The more intense the green color is, it was exposed to more radioactive elements such as uranium. Most green color diamonds arrive from Brazil, Venezuela and Zimbabwe. The problem with the fancy green color is that many times, although the rough looks green, in the cutting and polishing process the green disappears and turn into white. A diamond which has pure green color is very rare in nature. Pink color is caused by changes in the atomical structure of the stone. In most pink diamonds there are obvious clarity inclusions and the clarity grades range from SI1 to I1. Purple color which is called Violet caused by an addition of Hydrogen. The color which is called Purple is caused by changes in the atomical structure of the diamond. A pure purple/violet diamond is also very rare in nature. Gray color is the step brother of the blue color. They are called also the silver diamonds. The gray color is caused by an addition of nitrogen and boron. Brown color is caused by changes in the molecular structure of the diamond. When there is a low level of nitrogen in the stone it will get a champagne color. If the brown color is mixed with an orange color it is a cognac color. A pure brown color is very rare. Black color is caused by an opaque pigment that blocks certain areas in the diamond and makes them black. In the east there is a large market for black diamonds where it considered the gem that symbolizes grieve. Most black diamonds are treated and not natural. Orange color – a pure orange color is as rare as a pure red color. In order to be classified as a pure orange color, there has to be an absolute absence of brown. Chameleon color is a diamond with an olive color that changes it’s color from deep green to yellow when it under heating of over 200 degrees or if it is in the dark more than 24 hours. The largest chameleon diamond weighs 31.31ct oval shape. In most cases the fancy dominant color appears with another hue of color or more. The existence of pure fancy colors is very rare. The color of the stone –This is the most important criteria. It is even more important than the weight of the diamond. The most expensive fancy color is red, followed by blue, pink, purple, green, orange, yellow, brown, gray and combinations of colors. The black diamond considered in the past as a cheap stone, but lately there is a strong demand for black diamonds so it’s price became higher. In May 2016 there was an auction of fancy color diamonds. A Fancy Vivid Blue diamond, called “The Blue Openhimer” emerald shape, weighs 14.62 carat, was sold for 58.24 million dollar. In this month the “Unique Pink” a pear shape diamond of Fancy Vivid Pink color, weighs 15.38 carat, set in a ring was sold for 31.46 million dollar. In 2008 the “Gruff” company from London paid 24.3 million dollar for a Fancy Gray-Blue diamond in an auction in London. In 2010 the same company paid 45.6 million dollar for a Fancy Vivid Pink diamond, weighs 24.78 carat in an auction in Geneva. In 2015 the billionaire Josef Lu from Hong-Kong paid 48.4 million dollar for a Fancy Vivid Blue diamond, called “Blue Moon”, weighs 12.03 carat in an auction in Geneva. The night before he paid 28.5 million dollar for a Fancy Vivid Pink diamond weighs 16.08 carat. The intensity of the color – The more intense the color of a fancy color stone, the more valuable the stone. The vitality of the color – As much as the color of the stone looks vital and intense through the crown, its price will be higher. Distribution of color within the stone – The more evenly distributed color is within a fancy colored stone, the more valuable the stone is. In a gemological certificate, stones with uniform color distribution are designated as “Color Distribution: EVEN.” When the color is not distributed evenly it will be written: “UNEVEN. This will reduce the price of the stone. 5. The Sub-Color – It is very rare to find a pure fancy color diamond. In most cases the dominant color will have an addition of a cheaper color that will reduce its price. The weight of the stone – Of course, larger stones are more valuable. Clarity – Of course, the cleaner the diamond the higher it’s value. Fluorescence – Very strong and strong intensities reduce the price of the diamond. Cut – The attitude towards the cut is more flexible, especially in round brilliant cut diamonds, because in order to maximize the appearance of the fancy color, the stone must be cut in different angles than the usual ones. In fancy shapes in round cut there is no Cut Grade. In fancy colors there is a possibility to issue a full gemological certificate or a certificate that includes only the fancy color of the stone. Fancy Vivid & Fancy Deep – the most expensive level, a color which is full of life. The GIA started to grade Vivid only in 1995. Fancy Dark – A fancy color that looks as if it contains a black shadow. Usually appears in fancy pink and fancy blue. This is cheap color intensity. In fancy red color there is no grade of Vivid or Intense, only a Fancy grade. If the color is red it is already considered to be in this grade. Faint – This is a description of a very light color, like faint green which is not seen from the crown, and seen only from the pavilion. Very Light – This is a description of a very pale color, like, very light pink, which is not seen through the crown, and seen only from the pavilion. Light – This is a light color which is seen mainly from the pavilion and seen very weakly from the crown. As written, most of the fancy colors are not pure. 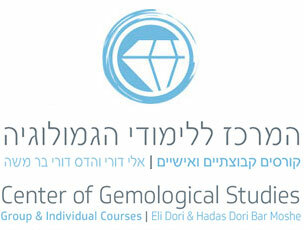 In the gemological certificate the dominant color will appear last in the order of the colors. When the color has an ending of the letters ISH, for example: Grayish Blue, it means that the gray hue is 15%-30% from the blue dominant color. There can be more than one hue in the stone. For example: Brownish Yellowish Orange means that the dominant color is orange with presence of yellow and a slighter presence of brown. If the hue is cheaper than the dominant color it will negatively affect the price of the diamond. If the hue is 40%-45% from the color there will not be an ISH ending, both colors will be written, for example: ORANGE YELLOW. It is not always possible to tell the difference between a natural fancy color and a treated fancy color. This problem usually occurs in fancy green colored stones because a natural green diamond gets its color from natural underground radiation, and a treated green color (using an old system of color treatment) gets its color from artificial radiation. Identification of treated fancy colored stones must be performed by a gemological institute, using a specialized piece of equipment called a “spectroscope” or “spectrophotometer.